I remember at this time last year, I was practically facing the ‘stress monster’ everyday. From designing personalised wedding and thank you cards, populating the perfect guest list, shopping for unique Disney decorative items to writing emcee scripts. Only one word could describe the process – chaotic. The thought of possible wedding mishaps simply drove me bonkers. Thankfully, the anxiety was short-lived as I’ve the most incredible bridesmaids who decided I should take a break from wedding planning by giving me the ultimate Hen’s Night Party.Since this was also a bridal shower to celebrate my impending nuptials, I thought it would be poetically beautiful to hold the celebrations in the hotel where my husband proposed. 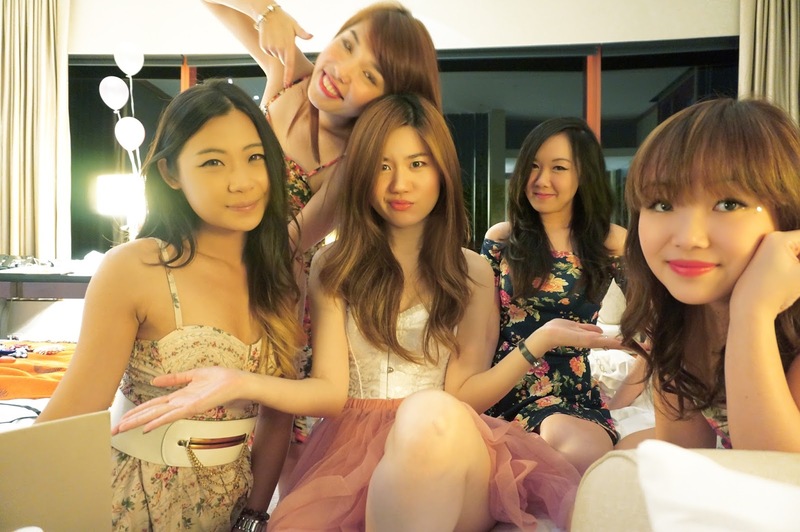 So I rented a room and ma girls planned the rest. I was never a wild child so my ideal Bachelorette Night was spending a quiet evening sipping champagne with my closest buddies in our private boudoir. My bridesmaids certainly got the memo so there wasn’t a dare list or stripper in sight. Phew! The Stagette was certainly one of the best nights of my life. It was full of surprises that were a perfect blend of naughty and nice. With such amazing friends, what more can you ask for? Well, maybe a blog post about my bunny-themed party with photos, peppered with some Hens Night tips? Goodbye my love! Enjoy your Stag Weekend in Hong Kong! After bidding my then-fiancé goodbye at the airport, I hurried home to prepare for my own epic Hens Party with the girls! Yay! I’m all set for my very own bachelorette staycay! – The royal scepter? Checked checked! – Gifts for my super bridesmaids? Whee! Triple checked! And off I go! I hope I survive the weekend. Haha! 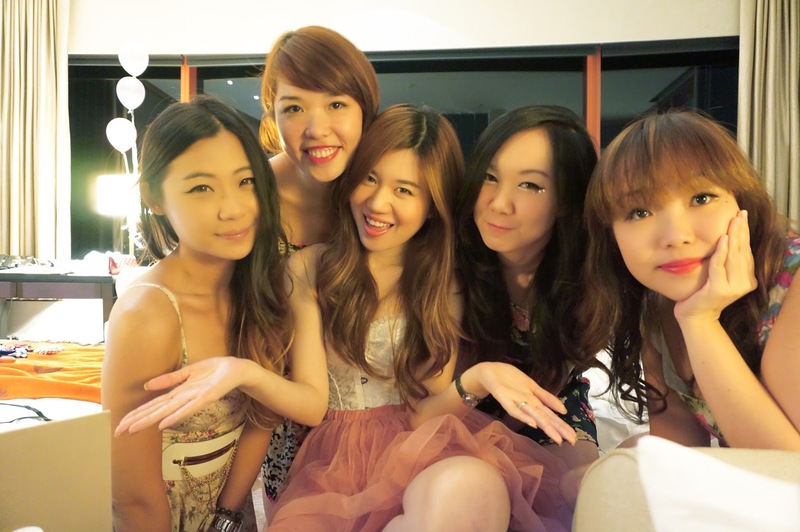 Don’t schedule the Hens Night too early, meaning three to four months before the wedding. Trust me, it can feel far less meaningful or exciting than is hoped. Don’t schedule it a week, or worst, a day before the wedding either as you don’t wanna be hung over on your big day. Also, holding it too close to the actual day might interfere with wedding preparations, budgeting or even pre-wedding dieting plans. On the day of my Hens Night, my bridesmaids told me they’d something on so none of them could make it early and suggested that I come later too. Even though I was slightly disappointed, I didn’t think too much about it. When I finally arrived in the late afternoon, I was utterly surprised to be greeted by these ‘Hens Bunnies’ and a hotel room that was exquisitely decorated with cool Princess-themed props. Haha! I totally didn’t expect this at all so you can imagine my excitement. 😀 As usual, incautious me missed all the tell-tale signs that my bunnies were up to something. No party can commence without an official opening ceremony. Forget the ceremonial scissors, ribbons and commemorative shovels. Just a good ol’ ‘Pop the champagne’ routine was all that was required to get the party going. It was scary but (phew!) I managed to do it. Haha! Next – pop the ceremonial balloon! To make sure I got the full regal treatment, my super bunnies also prepared my own Queen Bunny Hens Night regalia. All geared up and ready to party! My very own ‘Bachelorette Dessert Table’ gorgeously set up by my Hens Bunnies! Great champagne, yummilicious cake pops, Panna Cotta in cute bottles and of course, fab bridesmaids are every Hens Party’s must-haves! No Hens Party is complete without an exciting night-out with your girls, so we’re off to my favorite Hard Rock Cafe at Resorts World for dinner and drinks. 30 minutes into our dinner, I was invited to go on stage by the host, suggested by the girls of course. Even though there wasn’t a dare list of hilarious deeds, the girls still made sure I left my comfort zone to do a little dance stint on stage. Haha! It was embarrassing at first but it began to feel more enjoyable when I began to loosen up and just have fun. After a rather eventful evening, we went back to our room for the next segment – our Hens Slumber Party! We kick-started our girly bash by giving ourselves a makeover (and er… putting on cutesy ribbons). Our most favorite activity of the night – wefie time! I felt very special and cherished because of my girlfriends’ personal and thoughtful touches to my Hens Party so here’s my second tip for bridesmaids who are planning a Hens Night for your bride-to-be. Incorporate the bride’s favorite things, themes or anything that reflects her personality into the party. Trust me, she’ll feel utterly special and touched by your thoughtfulness. To make it even more meaningful for her, you can also create a keepsake photo album or book of messages which she can keep as a memento of the party. Since Tiffany couldn’t make it to the Hens Party, I handed her the bridemaids gift when she came over to visit. To thank everyone for giving me such an awesome Hens Night, I organised another Bridal Shower at my favorite nail salon, Nail Indulgence De Beau two days before the wedding for a pampering manicure treat before all the chaos began. It also happened to be Alice’s birthday that day so it was twice the celebration and twice the fun. Woo hoo! We even managed to surprise the surprisee with some secret birthday cupcakes. Yay! Even though my Hens Party had none of the insanity from movies like Bridesmaids, Hangover or Bride Wars, I couldn’t be happier with the surprise elements and their gallant effort to make sure it wasn’t just another night out. 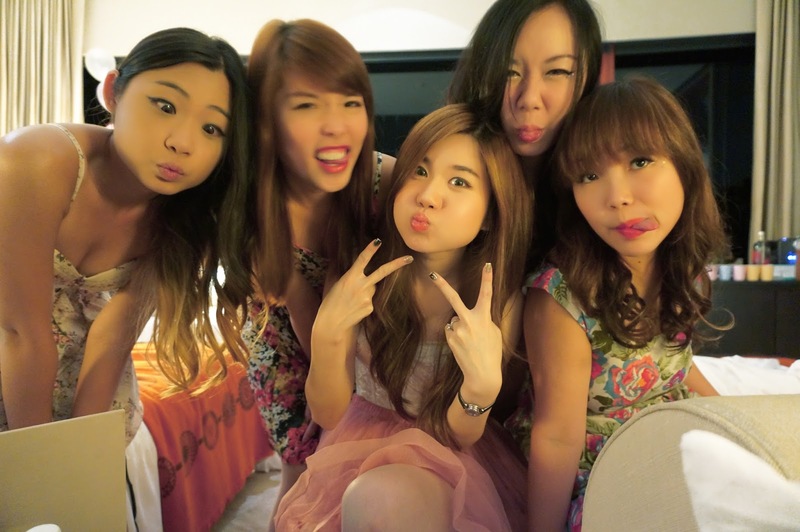 I’ll treasure these memories forever.I want to give a HUGE and special shout out to my amazing bridesmaids, Ashlyn, Jo, Jeslyn, Tiffany and Alice for investing an enormous amount of your precious time to plan the Hens Night, gatecrash and practice the surprise dance for B. Thank you for being so supportive all the way and making sure that everything is in keeping with my Disney theme. You are the best bridesmaids, friends and sisters! Love you all! For more exclusive content on my Disney themed wedding or to receive the full gamut of privileges as Honeyz readers, like my Facebook Page at fb.com/ilovebunny.net or follow me on my Instagram (@ilovebunnynet)!If you’ve more amazing bachelorette party ideas or experiences, please share them with me by commenting below! I Think I Just Found A New Best Friend – Meet Minnie, The Style Blogger!